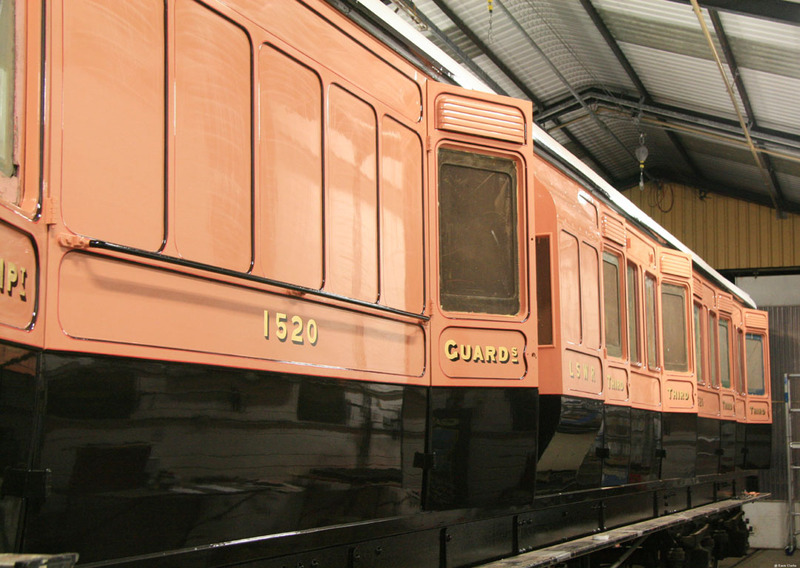 The superbly restored LSWR Brake Third Carriage No.1520 was relaunched today following a complete rebuild from a rotting stripped-out departmental shell. 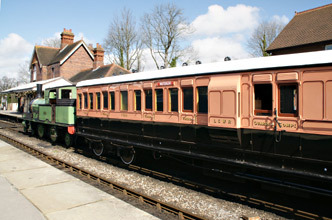 The coach, which is also celebrating its centenary (having been built in March 1910), was re-launched by Andy Pitt, Mangaing Director of South West Trains (effectively the modern-day LSWR). It was also posed with LSWR Adams Radial Tank Loco No.488 at Sheffield Park, and out on the line just north of the station for photos, and is seen on Poleay Bridge in this photo on the right from Derek Hayward. It is also seen as the first carriage in the special train hauled by "Fenchurch" in Andrew Strongitharm's photo below, passing Tremains crossing this afternoon. It should also be noted that significant effort has been put into refreshing the appearance of the Radial Tank in preparation for this momentous occasion. More photos of the event are available from Alex Morley, who also supplies the second and third photos below. 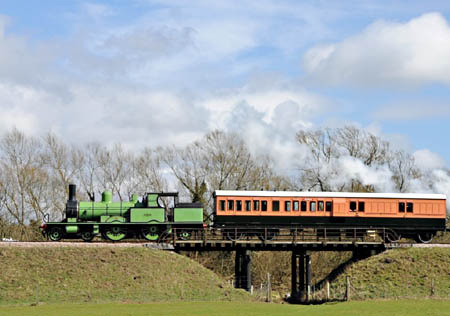 More of Derek's photos have been added to his 2010 photo album, including the fourth photo below, showing 672 to the North of Sloop Bridge. An update on this project is long overdue, since it is now close to completion! 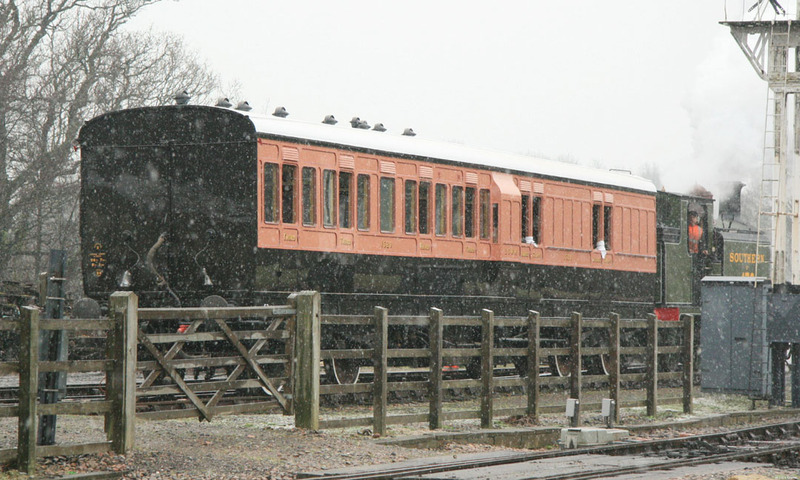 We hope it will be back in service around the end of this month, to coincide with the carriage's centenary. David Chappell's photo on the right shows the carriage moved over the pit yesterday for final mechanical inspection and setting up of the brakes and springs. Since the carriage left the paint shop 6 weeks ago a lot of effort has been expended on completing the interior (particularly the luggage racks, and the brake van area). The other major areas of work have been completing the insides of the doors, and the external brasswork, bump stops and drop-lights have all been fitted. The photos below are from Dave Clarke. The first one, taken on 20th January 2010 in the snow, shows the carriage being shunted by the freshly overhauled LBSCR No.B473. This was to move the carriage from the paint shop into the works for the completion of the fit-out. The photo on the right, taken on 3rd January shows the coach painted up to the point where Paul Welch had just finished the lining and sign writing of the East side. At that stage it still required further work on the lettering and lining on the other side, and the finishing coats of varnish. The two photos below are also from Dave. 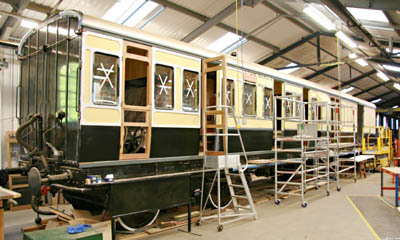 The first shows the coach in the works in April 2009, with mouldings going on, the quarterlight (window) glass fitted, and the door carcasses being fitted. 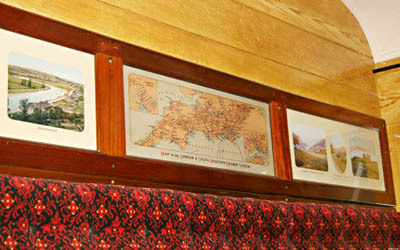 The second photo, from October 2009, shows the viewframes having been fitted, complete with reproduction views and maps. The colour prints are reproductions of original "PhotoChrom" prints which were contemporary with the carriage, and were originally produced both as postcards and as "views" for LSWR carriage viewframes. 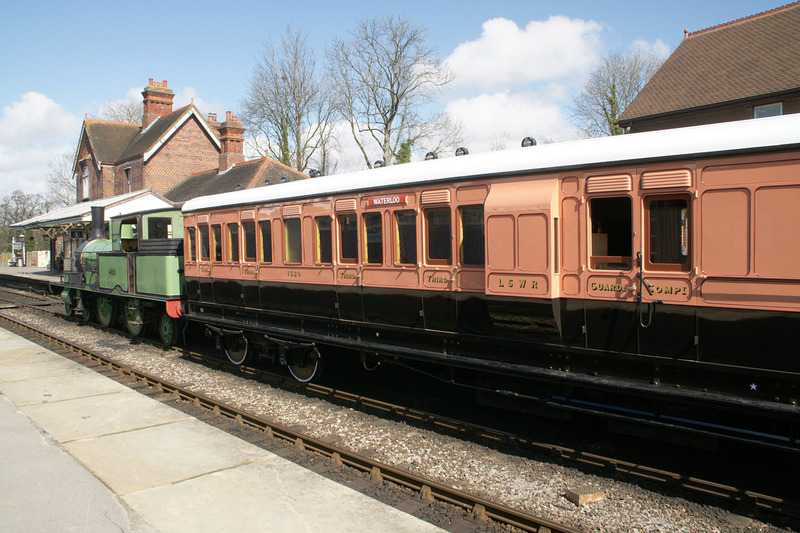 During the Bluebell 125 gala weekend we held an "open house" in the upper part of the carriage works, with visitors able to examine this coach at close quarters, and talk to members of the restoration team. This was a very well-received additional attraction. 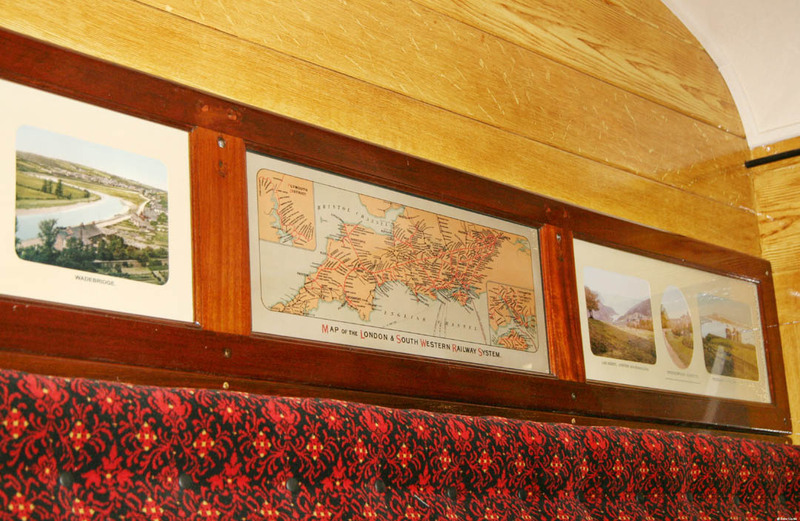 The photos right and below (Richard Salmon) show the newly trimmed seating trial-fitted to compartment A. 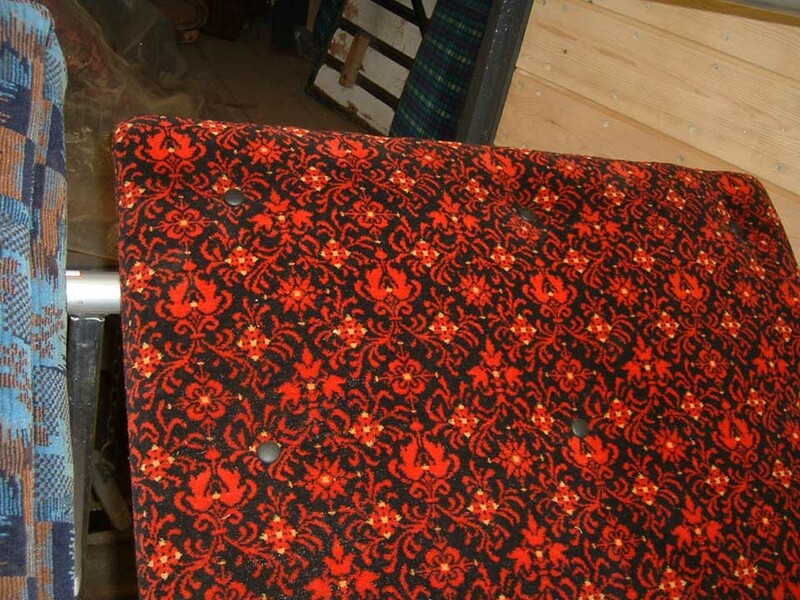 The moquette is a reproduction of a 1920s' pattern, which may be late LSWR or early SR.
We continue to make considerable progress on many aspects of 1520's restoration. In the past six months, we have overhauled and painted both bogies and the underframe. This has involved removing each bogie from under the vehicle and completing dismantling them. Remarkably little has needed replacing - mainly spring hangers and various bushes. 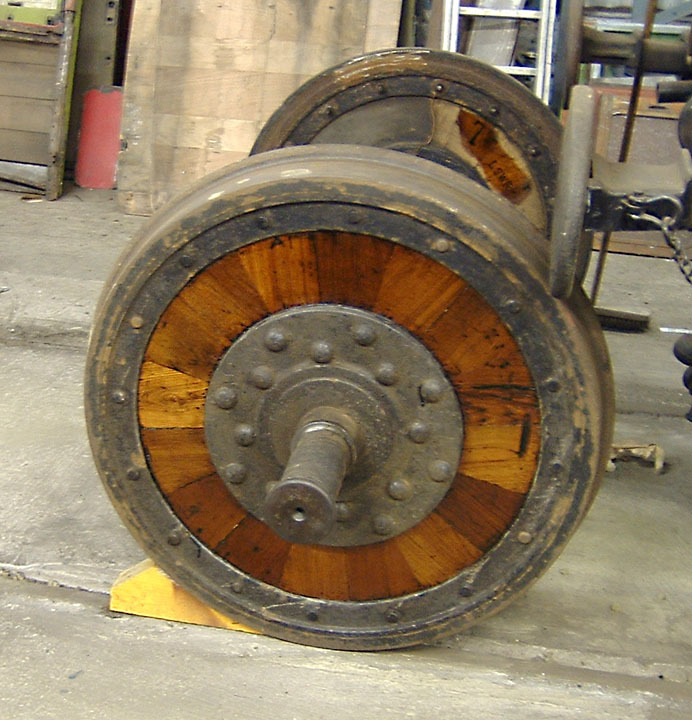 The Mansell wheels, each of which is made up of 16 teak blocks, proved to be in very good condition, and ultrasonic testing proved the integrity of each of the securing bolts. Subsequent application of varnish has brought this woodwork up beautifully. 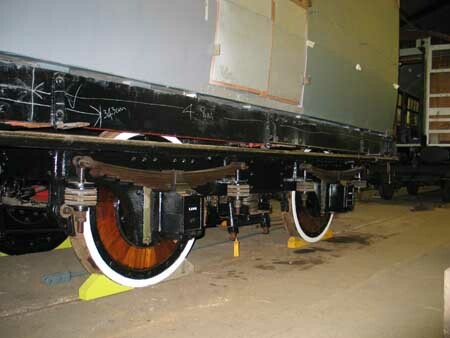 On reassembly, all metal work has been painted up to black gloss, with the exception of the axles, which have been painted bright red, in keeping with the clear evidence of red paintwork previously on them. The brake-gear has been thoroughly overhauled. Three new battery boxes have been made, and fitted to the underframe. The vacuum cylinders will be overhauled and refitted later. All the exterior mouldings on the west side of 1520 have been made and trial fitted, including those on the west ducket. As a result, the west side is starting to give a better impression of what the vehicle will look like when finished. 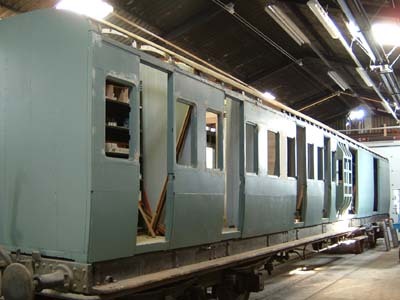 The mouldings for the east side have also largely been made, and trial fitting will start shortly. The sheeting on the east ducket has recently been completed. We are now building up the undercoats on both sides, the west side having so far received one coat throughout, and the east side three coats. The north end has been painted up to first top-coat, and all its mouldings final-fitted. New stepboards have been fabricated for the whole of the west side, and fitted to the vehicle. They have been painted up to black gloss top-coat. 'A' has been beautifully scumbled throughout, together with most of 'D.' Parts of the other compartments have also been so treated. All of the seat backs and some of the cushions have been made by the Trimming Department, and most of the seat backs have been trimmed. Heaters have been fitted in each compartment. Three of the four seat-ends have been modified, and the other one painstakingly made from new hardwood by one of our carpenters. Lino has been laid throughout the compartment floors using a dark brown/black pattern. We have recently returned to working in this area. The ceiling, all fitted with the original roofboards which we inherited, is being carefully filled and rubbed down where necessary. We have similarly filled and rubbed down the north wall, ducket interiors, guards' seats, guards' partitions, and the east side interior between the two sets of doors. 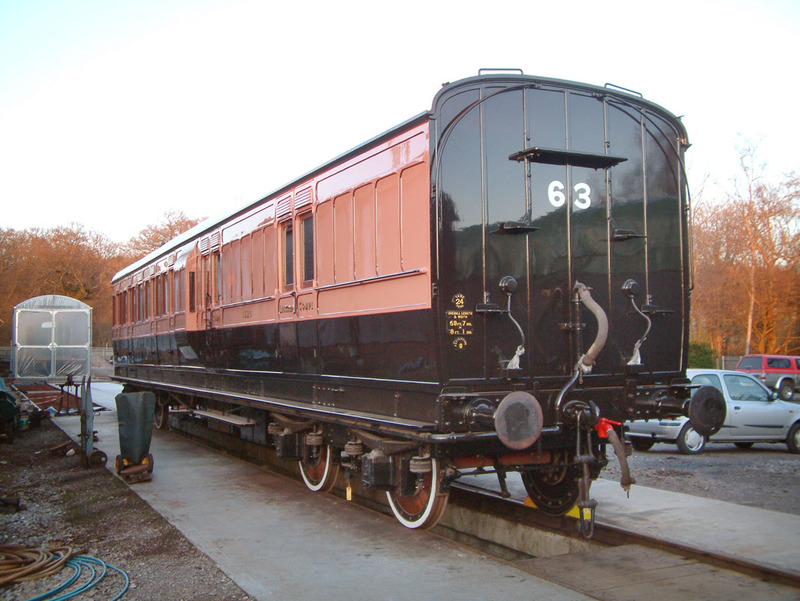 We have painted these up to the first top coat, which is a buff colour verified with the NRM and known to the LSWR as 'stone'. The progress we are making on 1520 is largely due to the commitment and number of volunteers now working on the vehicle. Several new volunteers have joined us this year, both weekdays and on Saturdays. We are now achieving nearly 500 man-hours per month. Our workdays continue to be every Tuesday and Friday, plus the first and third Saturday of each month and we will always welcome anyone who wishes to join us. At the same time, we are always very grateful for the help and advice of the C & W's paid staff. They continue to be invaluable to us in the more complex areas, in the safety-critical areas and in general matters beyond our experience. Publicity We were very pleased to be visited in February by a film crew and presenter from BBC1's 'Countryfile' programme. They showed great interest in the more unusual features of 1520, in particular the Mansell wheels: they christened 1520 'the coach with the wooden wheels'! Our vehicle duly featured in the following Sunday's programme, including some of our volunteers. Graham and Jill Parnell continue to do an excellent job running our shop. They regularly raise about £1,000 a year for the vehicle, and we are very grateful to them for their dedication. As always we welcome both railway and non-railway items, which please leave in the south end of our brake area. Not every visitor is interested in railways, and they like to find sale goods to interest them as well. But please no books except railways books! We have received two generous donations from the 'Mince Pie Fund,' which have helped us with some big bills, notably the window glass and the step-boards. We are equally grateful for this assistance. 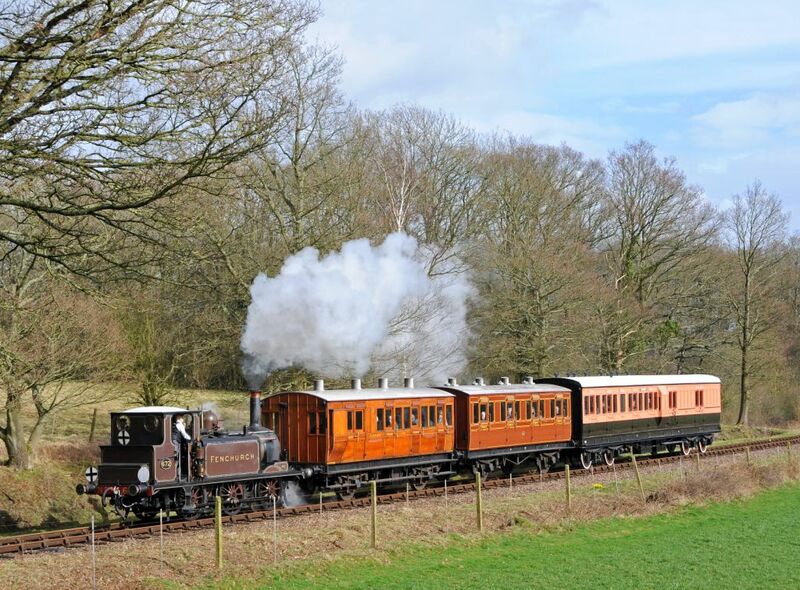 Any donations will be very helpful, please send them to our treasurer, Andrew Smith, at 'Springfield,' West Lane, East Grinstead, West Sussex, RH19 4HH, payable to ' LSWR Restoration Fund.' 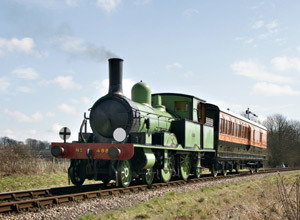 Donations of £100 or more may be gift-aided, with cheques made out to: 'Bluebell Railway Trust (LSWR Restoration Fund.)' Gift Aid form available here. Thank you. We feel we are making good progress towards 1520's restoration, under Tim Preston's continuing leadership. We have learned new skills and welcomed new people. At the same time, we are aware that there is much still to do and will continue to put our best efforts into seeing 1520 through to completion. 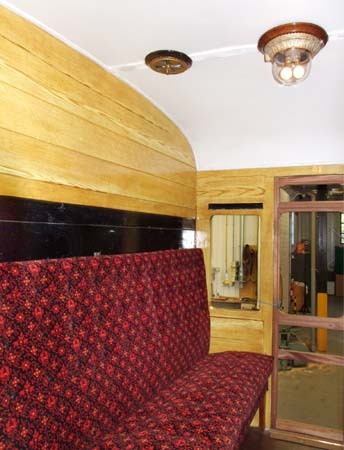 The interior of the coach has come on by leaps and bounds in recent months. The floors and inner ceilings are complete, and painting is proceeding, including the yellow undercoat for the scumbling (graining). 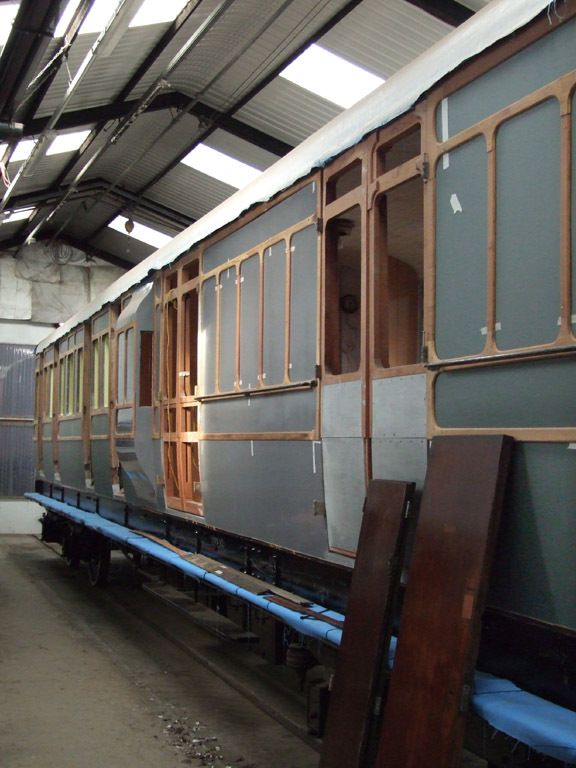 As is seen from the photo, not only are the interiors progressing, but the mouldings are being made, and fitted to the body-side of the passenger compartments. The exterior of the non-brake end has also come up to a similar state to the brake end. Over the last month the canvas has been bedded down, and received a couple of coats of paint. Work is also proceeding on the fitting of the new floor boards in the compartments. The most obvious news is the fitting in the last few weeks of the traditional roof canvas. In Dave Clarke's photo the canvas is seen weighted down to stretch it flat over the roof. It has now been bedded down with roofing compound, and received a couple of coats of paint. Details are available here of the techniques used. 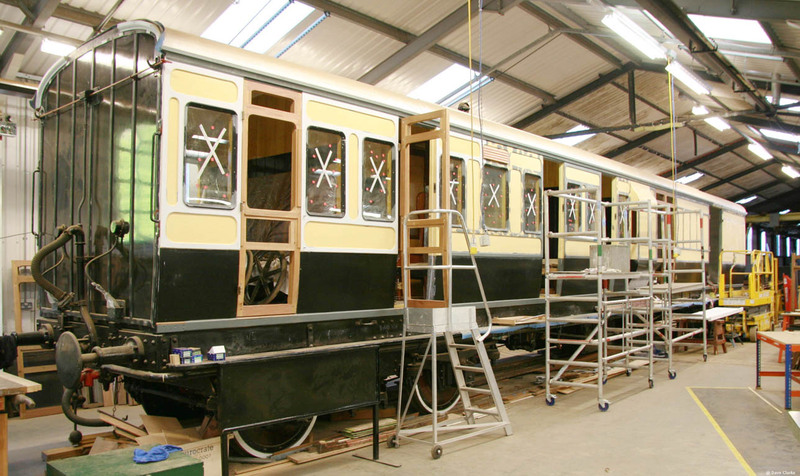 The brake end of the coach has now been painted up to first black gloss coat, and the mouldings and end-steps are now being fitted. Also visible in this photo are the first mouldings which have been made and are being test-fitted to the side of the brake van. 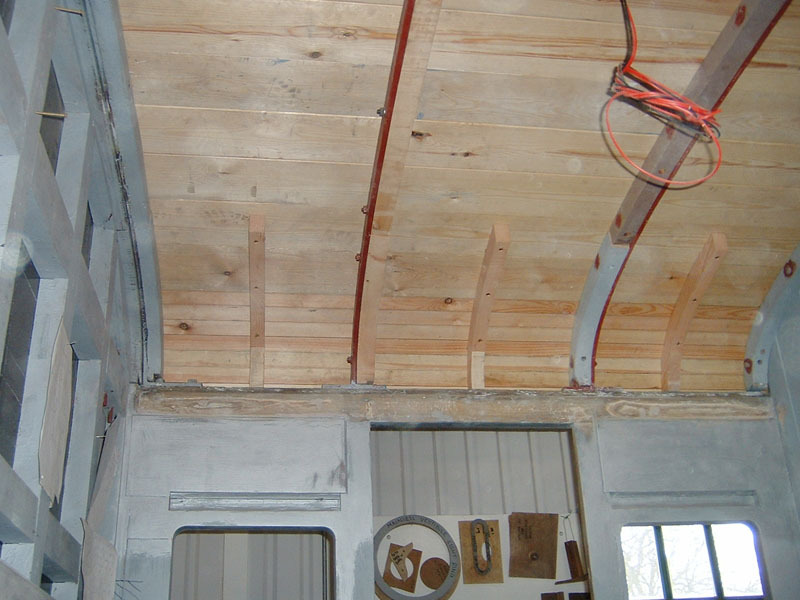 The photos below (taken back in February by Richard Salmon) show the interior of the Guard's area well advanced, and the roof of a passenger compartment being prepared for the fitting of the ceiling. We have achieved great progress throughout 1520 in recent months. We have taken big steps forward in the brake-end interior, the compartments, the exterior roof, the south end exterior, the guards' duckets, the electrics and exterior steps and grab-rails. We are always grateful to members of the paid staff for their ready advice and assistance, and especially for their kindly handling some of the more complex repairs. Graham and Jill Parnell have once again exceeded their annual target of £1,000 for our shop's takings - by taking £1,007 during 2005! The woodwork of 1520's exterior roof is now complete throughout the length of the coach. Our thanks to Andy Mills and Andy Smith for their initial work, and to Sheina Foulkes for the great job she did in completing the roof and ensuring a very tight fit. We shall proceed to canvassing the roof and then fitting the roof furniture - torpedo vents, rainstrips and gutter woodwork - as soon as all the mouldings have been fitted. This is another area where we have seen much progress. Tim Preston, Jonathan Burley and Richard Smith completed fabrication of the mouldings, and members of the midweek gang completed the grab-rails and steps. We are grateful to Gordon Holmes for taking on the job of painting the south end, using skills learned from Graham Ward. To date Gordon has applied three of the four coats of undercoat necessary, each one being of a different colour so no patches get missed. The exterior will have twelve coats in total, including primer. Gordon has applied coats of Midland red, grey and "ice-cream green": the final undercoat will be grey, and then he will apply one topcoat of black. Meanwhile, various members of the group have painted the mouldings up to one topcoat on both sides, and these will be final-fitted once Gordon's first topcoat is in place. Thereafter the grab-rails and steps will be fitted and then further topcoats applied. Back in September our contract carpenter, Jim Holliday, encountered a problem with the brake-end south-east door opening, whilst he was endeavouring to match pairs of doors to each opening. It transpired that this opening was trapezoidal in shape, owing to the north pillar being twisted out of a vertical plane. After removing all the adjacent internal boards, we found that the bottom rail mortise was bigger than the pillar's tenon, which in turn allowed the diagonal metal bracing to pull the pillar out of shape. This was a consequence of the method of inserting the bottom rails when the coach was in platform 1 where it was necessary to have some flexibility in the tenon to get the bottom rail in situ. Sheina came to our rescue in fabricating a new pillar, effecting a substantial repair to the bottom rail, and reassembling it all for us. Thereafter we removed all the new internal cladding to ensure there were no similar problems elsewhere in the brake-end. 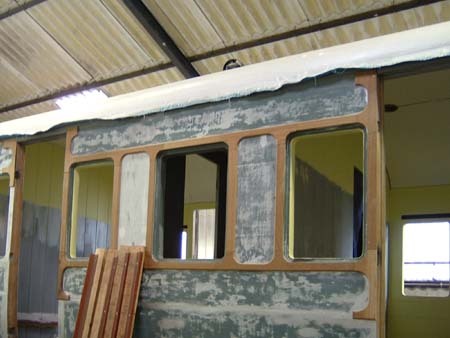 In keeping with the original design, bevels were added to the top of every internal cladding board, earning the coach the nickname 'Beverley'! Patrisses were added at the south end to receive the housing for the RCH jumper cables and the side supports for the parcels shelf. Steve Bigg and Robin Cane then final-fitted the cladding all round the brake-end. Since then, Jim Turtle has nobly filled all the screw-holes in both the sides and the brake-end roof, and is part-way through rubbing them down prior to painting them up to first coat of top-coat. Whilst the cladding was being refitted, we also removed the temporary floorboarding, which for several years has stopped us falling through the floor! We had hoped to proceed with the relatively easy job of laying most of the floorboards, but nothing comes easy on this coach. During the autumn we found no less than five of the floor cross bearers needed replacing. This was mostly owing to old damage and some rot, as well as a couple of over-optimistic repairs in the early days of the project. We replaced them all, once again appreciating the guidance of the paid staff. During December, we finally got the rest of the floorboards down. However, even now things were not straightforward, since the original floor framework, which has clearly had a hard life, maintains an undulating profile! After discussion with Ray Penn, we are fitting spacers underneath some of the floorboards, so that the guards of the future do not trip over - we'd hate that to happen! Over the Christmas holiday period Steve, Robin and the writer fitted the three bearers for the parcels shelf at the south end, having first of all offered up the (very heavy) shelf, to ensure an accurate fit. This will allow Jim Turtle a clear run in his painting. Meanwhile, away from the coach, we continue to strip the actual shelf back to bare wood, as this will need painting up to top-coat prior to fitting. The two securing shoot-bolts have been grit-blasted, and the steel hinges are about to receive the same treatment. Both duckets are complete, apart from the fitting of some external sheeting, glazing and painting. We have taken delivery of the sheeting and the glass, so both these jobs should be completed soon. 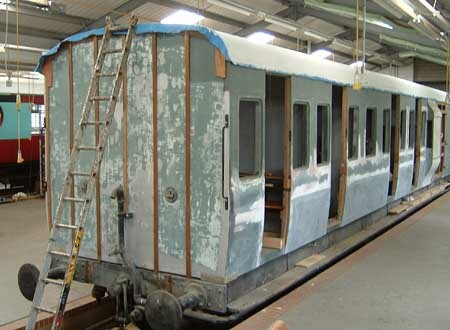 The Loco Department have kindly shot-blasted our hand-brake structure, and we have now painted this up to top-coat. An outside contractor is currently manufacturing a new shaft and nut, and when these are received, we shall refit the whole hand-brake structure. Both bulkheads were refitted during the summer. 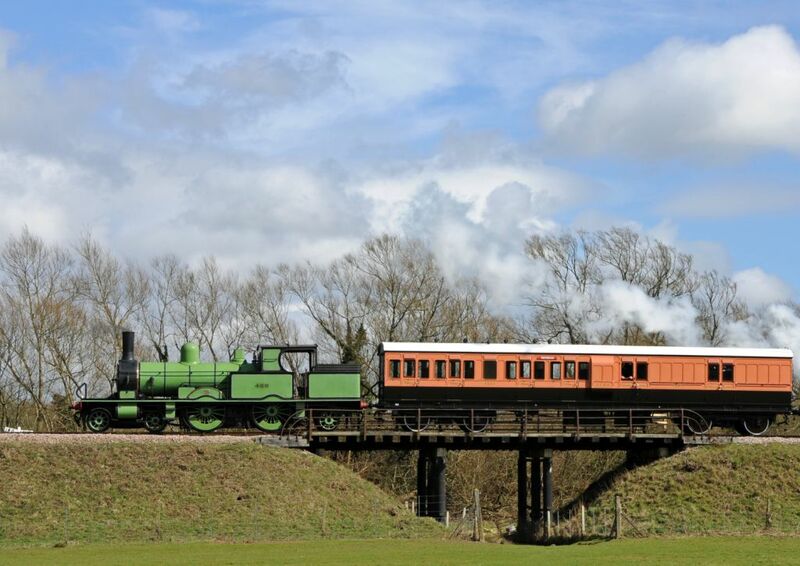 One used original timbers, whilst new timbers were needed for the west side, to replace those removed when the vehicle was departmentalised in 1948. We need to fit the roof mouldings around these bulkheads, as well as at each end of the vehicle. We have one set of original mouldings, which will act as a template, and also show us how the LSWR bent the wood to follow the roof profile - another useful skill to be learnt! Meanwhile, Jim Turtle will be proceeding with painting the bulkheads, as well as the entire inside of the brake-end; we are very grateful to him for taking on this job. In parallel with the painting of the brake and the panelling, we are also working on final finishing of the brake-end ceiling. Our contract carpenter, Jim Holliday, has done an excellent job of fitting all four west-side brake-end doors. He carefully matched up the doors in pairs to each opening, and re-profiled them where necessary. He also rebated the tumblehome profiles in order to accept the plywood panels, as well as the waist panels that fit there. 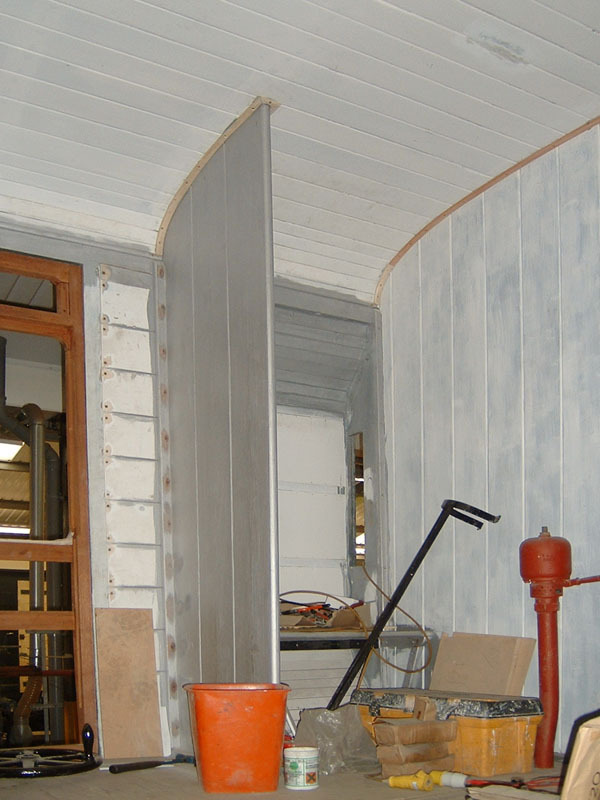 We have been very impressed with how Jim has learned the vagaries of railway carriage carpentry and with the amount of work he has put in coping with 1520's quirks. As I write, Jim is now well advanced in profiling the pair of doors for the south-east brake-end opening. Meanwhile, Tim Preston, Jonathan Burley and Richard Smith have made the plywood panels for two of the west-side doors. During the early summer, some of the midweek volunteers fabricated all four of the brake-end horizontal grab-rails. These were trial-fitted whilst the internal cladding was down, with a small screw being drilled through the head of each bolt from the inside to secure each one in position, and thus allow the cladding to be refitted. We cannot final-fit the grab-rails until the side exterior mouldings have been fitted. We expect this to take place around Easter time. Colin Quaife and Gordon Holmes have put a lot of work into the compartments during the summer and autumn. They first of all finished returning the recesses for the blind-boxes to their correct narrower profile in all four compartments. They appear to have been widened in 1938 to Maunsell's wider spec to give a more effective blackout for the War. They then removed all the panels above the quarter-lights, to remove other wartime botches and return them to their correct profiles. 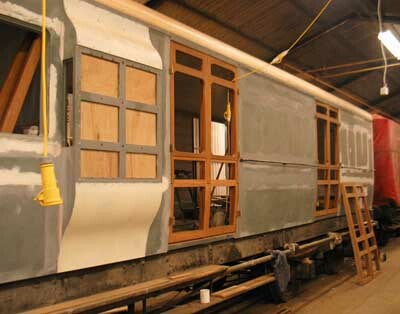 They then sanded and primed them before refitting all eighteen such panels. Whilst engaged in this work, Colin and two Friday volunteers have also made a start on stripping the paintwork from the cantrails and door pillars. This will enable us to locate evidence such as screw-holes for the communication cord trumpets and holes for the c.c. piping. In addition the above work, Colin has also fitted twenty-six intermediate quarter-roof bows to the compartment and lavatory roofs. He has made an excellent job of profiling these. The next stage for these inner roofs is the fitting of patrisses for the light and ventilator fittings, followed by hardboard panels secured to the roof bows and cantrails. Meanwhile, Gordon has also taken on the overhaul of all the door locks throughout the coach. This is a fiddly but very important task, and we much appreciate his offer to do this for 1520. We have two compartment doors so far, and are currently looking at alternative options to progress completion of the other six. Jonathan Burley, Chris Taverner and Tim Preston have been occupied in the time-consuming task of cutting the steps in the bottom rails to take the doors and the brass treader plates. Out of the sixteen doors, four rebates now remain to be cut. Our resident trimmer, Steve Bigg, has now completed both seat backs for Compartment D. These are now wrapped in polythene sheeting and stowed in that compartment. This simple statement covers a lot of work on Steve's part in shortening 4-LAV seat backs, fitting springs, carefully packing them with horsehair, trimming and finally button-backing them. 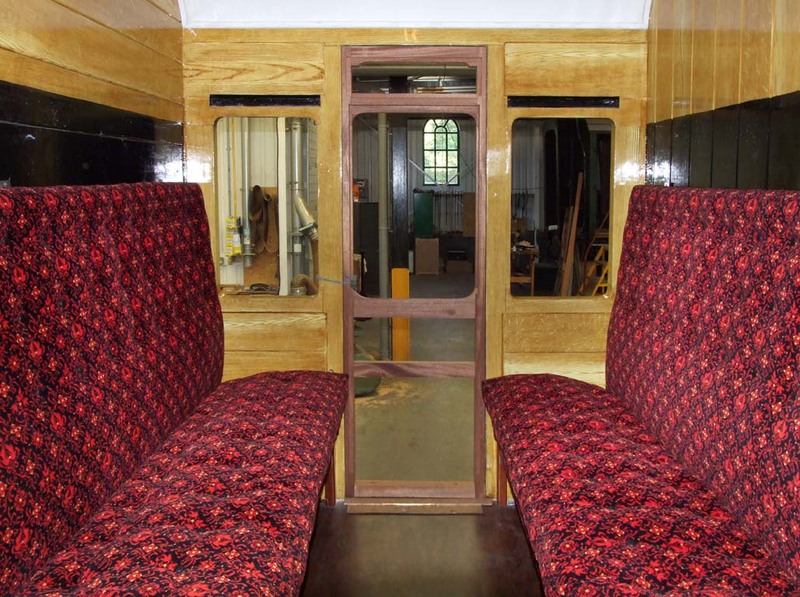 The trimmers have more recently been working on the seats for the last Chesham coach, but expect shortly to commence work on constructing our first two seat bases. 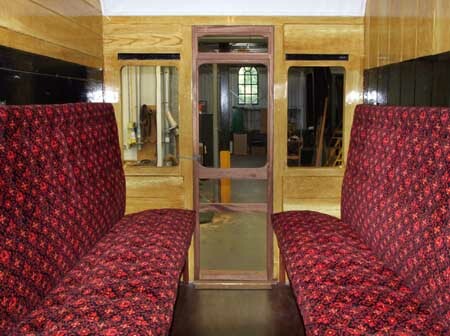 Steve has done a first-rate job on these seats, which will do much to show 1520 in its former glory. Since the last Newsletter, Nicholas Blake and Keith Francis have completed all the wiring on 1520! This means all the wiring below the floor, all in the roof, the installation of the light fittings and the wiring for the RCH jumper cables. They even have both the ceiling lights in the brake-end working, which means that at last we can dispense with tripping over lots of extension leads on the floor! The only outstanding jobs are the enclosing of the wiring in trunking down one wall panel by the east guard's seat, and the fitting of a small light above this seat. This latter feature was not a part of the original design, but we believe it necessary to assist our guards - otherwise their light will be obscured by the bulkheads. Thank you to Nicholas and Keith for their very professional work. As mentioned earlier, Graham and Jill have earned our group £1,007 from their operation of our stall in the LSWR Road Van in Platform 1 and their attendance at local car boot sales. This compares favourably with last year's total of about £1500, since the latter figure included about £450 from the exceptional sale of Tom Martin's collection of 800 78s. This fund-raising is especially important as we approach expenses such as fitting out the compartments and the underframe mechanics. As always, our thanks to Graham and Jill. They in turn ask particularly for any railway-related sale items and for non-railway items for children. Please leave any sale items in 1520. 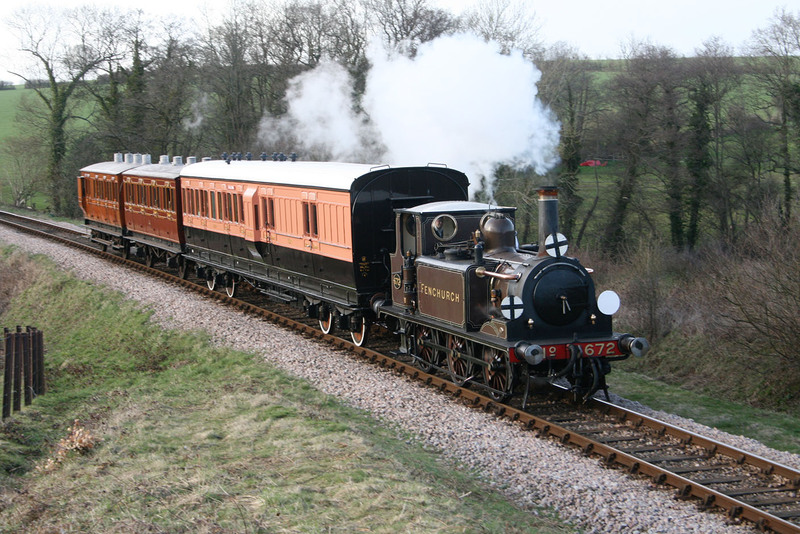 We also welcome any financial donations, which should be sent to our Treasurer, Andy Smith, at Springfield, West Lane, East Grinstead, RH19 4HH. The high level of enthusiasm amongst our volunteers has enabled us to start a third workday, on Fridays. This means that we now work on Tuesdays, Fridays and every first and third Saturday. The average attendance is 6-7 volunteers on Tuesdays, 3 on Fridays and 3-6 on Saturdays, meaning that we are putting in around 400 man-hours per month on 1520. We believe that we can be very proud of this level of commitment and sheer hard work. We are always pleased to welcome new volunteers to our group. Andrew Breese joined us in November and we are very glad to have his assistance. We feel very pleased with the progress we have made on 1520 during the last six months, under the continued leadership of Tim Preston. This progress has been in the face of some frankly daunting difficulties, every one of which has now been resolved. We wish to thank every volunteer working on our project and also Tony Funnell and all members of the C&W's paid staff, who continue to give excellent advice when we need it, as well as very constructive assistance. Great progress, with the completion of the re-roofing, internal panelling of the brake compartment, and much more. Here the new door carcasses are seen on the brake end; getting these to fit is one of those jobs which no-one really wants to take on, but great strides are now being made. The first of the seats are now being trimmed, using a LSWR/SR moquette from the 1920s which was reproduced for this project, and others on the Bluebell and the Isle of Wight Railway. In the last two years, great progress has been made on 1520, under the excellent leadership of Tim Preston. 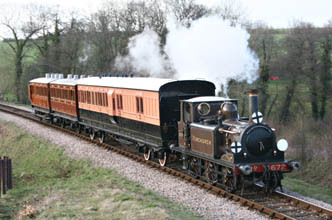 Our work has been greatly helped by the move, in May 2002, into covered accommodation in the Carriage and Wagon works. Having been parked in Platform 1 since 1996, we can now avoid bad weather and no longer have to waste two hours every work-day removing and replacing the protective tarpaulin! We completed replacement of all the bottom rails by mid-2001, apart from the section over the north-end solebar, which just needed two small repairs. 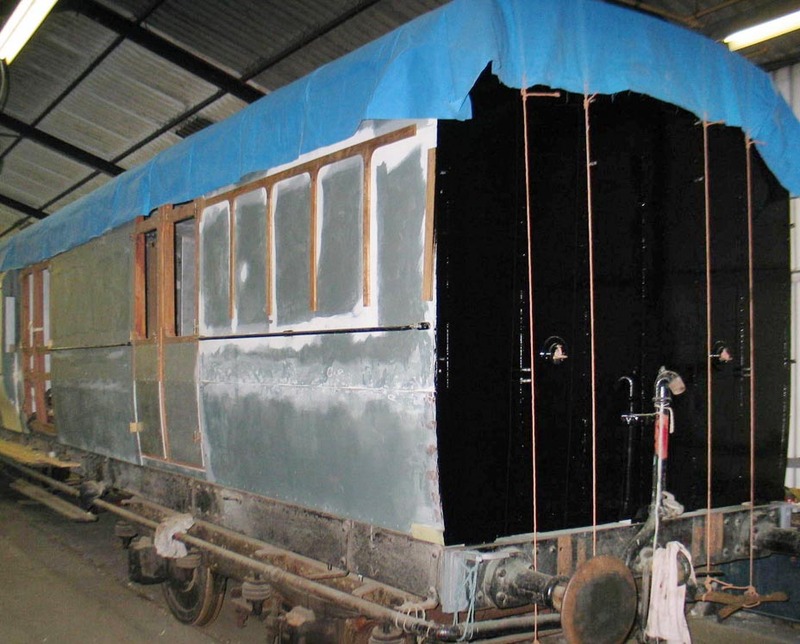 By mid 2002, we had completed all necessary repairs and replacement sections for the side framework throughout the coach. Quite a lot of the original framework was reusable, as well as some door pillars. 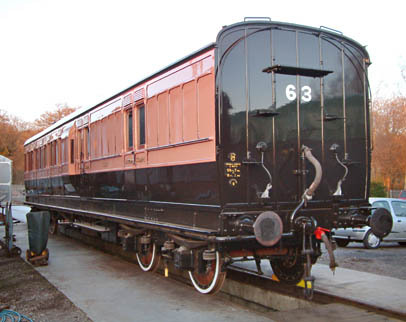 Most of the replacement pillars came from a grounded LSWR body, dating from 1906, which had the same side profile. This vehicle, despite being beyond repair, yielded much sound teak, which has allowed us to carry out repairs using contemporary LSWR woodwork, rather than having to purchase new oak. The Bluebell's paid staff also manufactured two new pillars for us which was a great help. Having completed the framework, we were then able to commence cladding the sides. 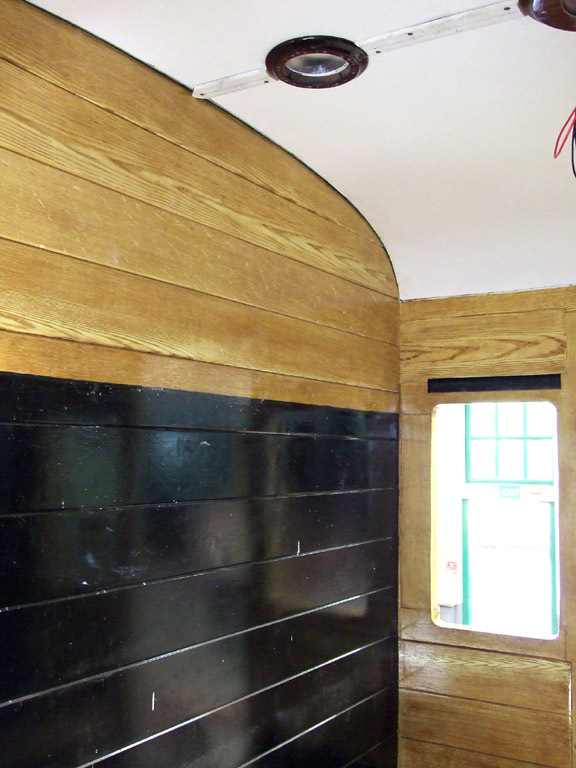 This required new plywood all round the coach, replacing the metal sheeting fitted by the Southern Railway in the 1930s. This task occupied most of our group, particularly Dave Murga and the writer, throughout last winter, and was completed in February 2003. 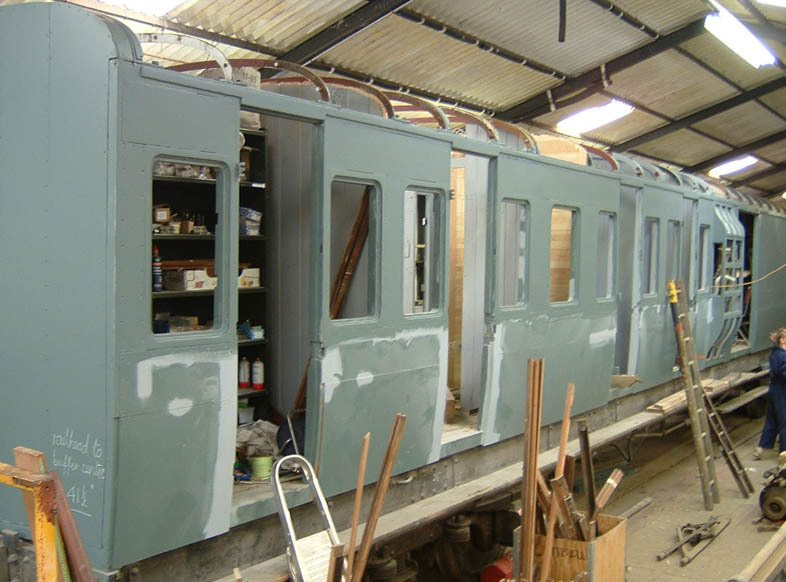 Since then, the vehicle has been painted up to grey undercoat level and now looks considerably more presentable than at any time in the last fifty years! Please have a look at the photos attached to this update which were taken since 1520's move into `A' road (the old paint shop). 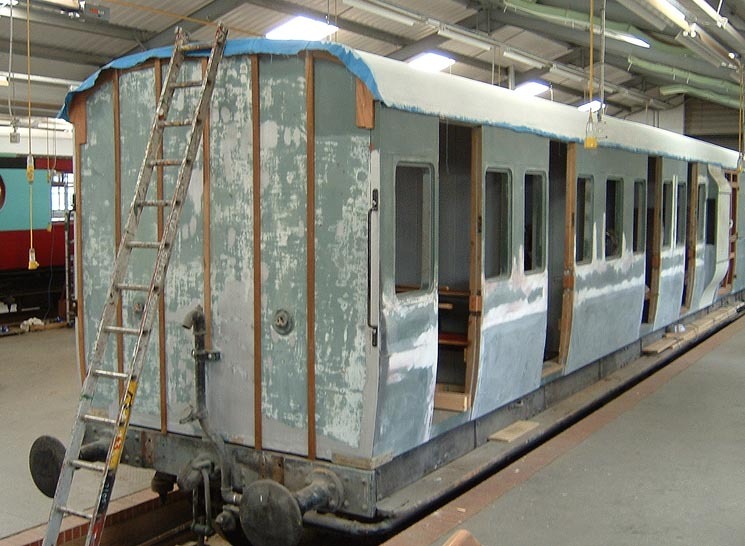 Since February, much attention has been given to filling the many body-side holes which the coach has accumulated over the years, mostly in the window frames and door pillars - a job also now completed. 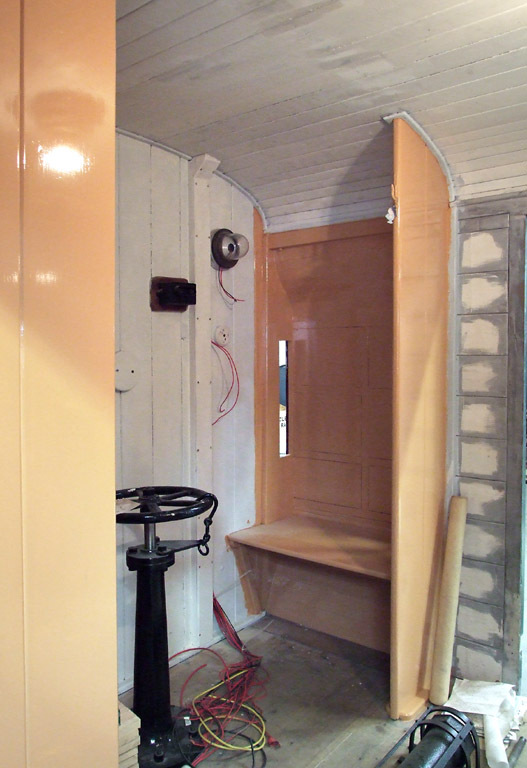 The partitions between each compartment, and also adjacent to the brake-end, are now complete, apart from a few repairs, thanks largely to dedicated work by Jonathan Burley this year in building one complete new partition next to the lavatories. These partitions are double-thickness to provide sound insulation, and proved a good test of Jonathan's carpentry skills! The only partitions remaining to be fitted are those surrounding the doors into the lavatories. A detailed examination of the external roof-boards in June, 2003, produced the regrettable discovery that they will have to be completely replaced. The tongues and grooves have disintegrated, and some of the boards are also split. An investigation of the wooden roof-bows has also revealed that about half of these will need replacing, as they have been split by corroded bolts. The metal roof-bows are, however, all reusable. Nothing daunted, Andy Mills and Andy Smith removed all the roof boards in one day's work, and we have purchased the replacement boarding. This will be fitted in about two/three months'time, once the new boards have completely dried out. We have some new roof-bows already, and will shortly be making up the balance. There are two areas of good news on the roof. We believe that we can retain the internal boarding at the brake-end, as this is in better condition than expected. Also the cantrails are all reusable, with some repairs, which are currently being undertaken by Caroline Burley and the writer. Peter Milnes constructed the eight new doors for the brake-end during 2002, and we expect to commence hanging them during this coming winter. We shall also be asking Peter to construct the eight compartment doors, but not until 2004, as our funds are running low and we are unlikely to be ready for them any earlier. Chris Willis has assembled a set of brass fittings and has painted the external ventilator covers and torpedo vents. Missing items of metalwork will be ordered when we get closer to needing them. We plan to swap out both bogies during November, replacing them with accommodation bogies, so we can commence their overhaul and repair under the guidance of the paid staff. Needle-gunning the underframe will resume at the same time. (Members of the group are not allowed to go sick during this particularly "enjoyable" task!). We remain on target to have 1520 completed by 2006. This summer is being spent replacing condemned roof-bows and cleaning up and priming reusable ones, filling holes in the cantrail and in putting the finishing touches to the partitions. Work will also start on cutting rebates into the bottom rails to take the protective metal strips into which the doors will close. (Exactly the same design as on "slam-door" stock on the national rail network ...!). The move into the C & W shed last year allowed us greatly to step up our working days from the previous two per month. We now work on 1520 EVERY TUESDAY, FRIDAY AND SATURDAY. So if you can give us some of your time - just as often or as little as you wish, you will be very welcome. We supply not only tea and coffee, but home-made cake as well - courtesy of Caroline Burley and Josephine Pepper! Graham and Jill Parnell continue to do an excellent job running our shop, which is located in the LSWR road van in Platform 1. Already this year they have raised more money than they did during the whole of 2002. 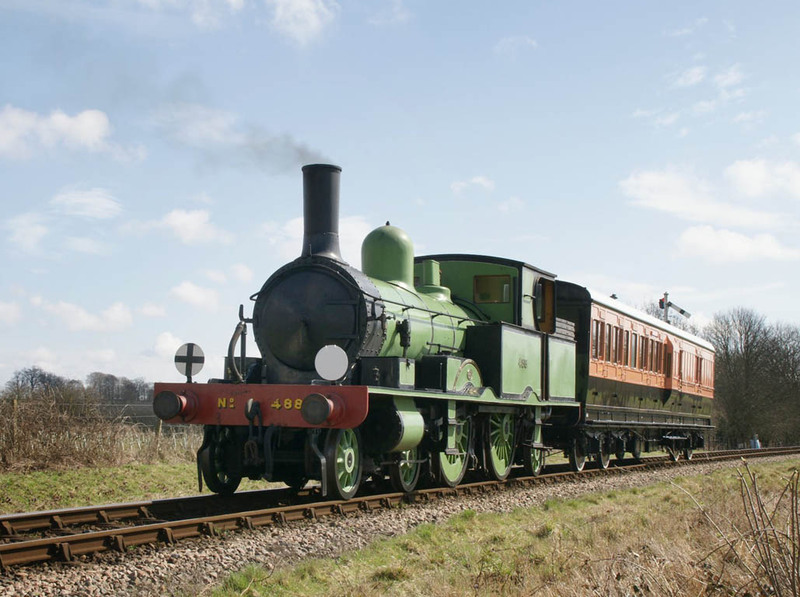 Recent expenditure has virtually exhausted our funds, and we have some expensive purchases to make later this year, so donations are as welcome as always - either direct to our Treasurer, Andy Smith or, if using the Gift Aid or CAF cheque scheme, to the Bluebell Trust, marked "LSWR Restoration Project". We wish our restoration of 1520 to be as authentic as possible, and that includes the two lavatories! We inherited one Southern Railway lavatory, but ideally would like to have two LSWR ones. So, if you have a LSWR lavatory which has become redundant or unpopular at home or in the garden, we would greatly welcome it! Now moved into the northern-most bay of D-road, due to No.1336 being moved into the paint-shop for re-canvassing of its roof. The roof hoops are just about ready to receive the new roof timbers. Inside the caoch the new seat supports are being prepared. On the lower bodyside you can see where some, but not all, of the edge-strips (solid mahogany) have been fitted. These provide solid wood into the door opening protecting the vulnerable edge of the plywood panels. With the full-time staff concentrating on completion of No.4957, the paint-shop became free so the coach was moved in there. Work continues on the preparation of the roof hoops and new partitions, and on interior components. Repairs to final two door pillars now completed. The entire body exterior now has all its new plywood panelling in place. The new toilet partition is nearly finished. Castings for luggage rack brackets have arrived and been painted. Go to: The Archive of earlier restoration reports.